The Caribbean side has also included two debutants in their playing XI — Chandrapaul Hemraj and Oshane Thomas. 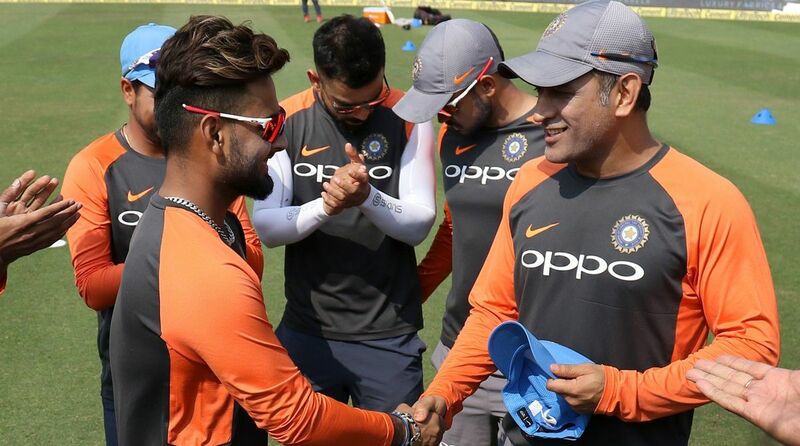 Young Delhi wicket-keeper batsman Rishabh Pant on Sunday received his maiden One Day International cap from former Indian skipper Mahendra Singh Dhoni before the start of the first ODI match between India and the West Indies. The opening match of the five-match ODI series between India and West Indies is being played at the Barsapara Cricket Stadium in Guwahati. Rishabh Pant has been included in Team India as a specialist batsman as MS Dhoni will keep the wickets. With Dhoni out of form with the willow, Pant, along with Ambati Rayudu, is expected to fix India middle-order woes. The stylish left-handed keeper-batsman impressed the selectors as well as Indian coach Ravi Shastri in the 2-match Test series against the West Indies in which he scored 184 runs in 2 innings at an average of 92. Rishabh Pant makes his ODI debut for India, Oshane Thomas and Chandrapaul Hemraj for the Windies – hosts choose to field in the first ODI in Guwahati. Other than Pant, Virat Kohli has also included left-arm pacer Khaleel Ahmed in India’s playing XI for Sunday as they decided to play with three seamers and rest chinaman spinner, Kuldeep Yadav. Mohammed Shami and Umesh Yadav along with Khaleel Ahmed will lead India’s pace attack against the West Indies. West Indies (Playing XI): Kieran Powell, Chandrapaul Hemraj, Shai Hope(w), Shimron Hetmyer, Marlon Samuels, Rovman Powell, Jason Holder(c), Ashley Nurse, Devendra Bishoo, Kemar Roach, and Oshane Thomas. India (Playing XI): Rohit Sharma, Shikhar Dhawan, Virat Kohli(c), Ambati Rayudu, MS Dhoni(w), Rishabh Pant, Ravindra Jadeja, Umesh Yadav, Mohammed Shami, K Khaleel Ahmed, and Yuzvendra Chahal.